The British royal family tree is fairly large compared to most other charts of European monarchies. One of the reasons for this is that the kings and queens of the United Kingdom seem to have a tradition of producing fairly many children – and on top of that also seem to be following the modern trend of divorcing. E.g. 3 out of Queen Elizabeth II’s 4 children have been divorced and both Prince Charles and Princess Anne have remarried. On this page I will go through the history of the royal family tree of the British monarchy, an illustration of which, you will also find on this page a little bit further down. 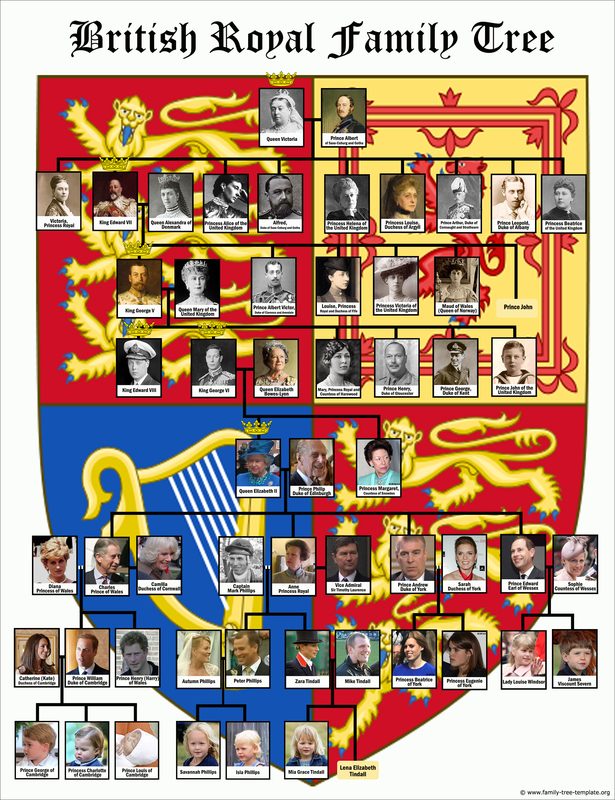 The English royal family tree on this page is free to print. The dimensions of the British royal family chart is 25 cm x 19,23 cm which makes fit perfectly on an A4 piece of paper. The resolution is fairly high, 215 dpi which gives it a pretty print result. Before going through the British royal genealogy, I will quickly sketch up the most important events in British royal history. The year 1603 was a landmark in the history of Britain as King James VI of Scotland got to inherit the British throne and thereby became the ruler of England, Scotland and Ireland together. Another important year was 1707 as the creation of the Kingdom of Great Britain were made when England and Scotland were joined together under Queen Anne. Almost 100 years later under the rule of King George III Ireland was added too, making the name little longer: the United Kingdom of Great Britain and Ireland. 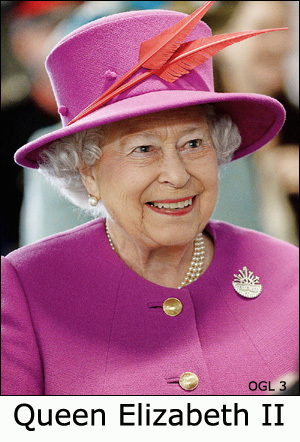 Today Queen Elizabeth is regent of the United Kingdom (which includes Scotland and Northern Ireland), Australia, Canada and New Zealand, and is Head of the Commonwealth. This was a very, very quick introduction to the history of the United Kingdom. If you want learn more in-depth you may e.g. go here. Let’s start our tour of the British royal family tree with its main character, the current regent Queen Elizabeth II. Queen Elizabeth II has been the ruling monarch since 1952 when she inherited the throne after her late father King George VI. Queen Elizabeth II has one younger sister, Princess Margaret, who passed away in 2002, 71 years old. In 1947 Queen Elizabeth II married Philip, Duke of Edinburgh. Together they have four children Charles Prince of Wales from 1948 (1st in line to the throne), Princess Anne born 1950, Prince Andrew from 1960, and Prince Edward born 1964. The four children of Queen Elizabeth II all married and all produced a minimum of two children each, a few of which also have children which makes Elizabeth not only grandmother but also great grandmother. “1992 is not a year on which I shall look back with undiluted pleasure. In the words of one of my more sympathetic correspondents, it has turned out to be an Annus Horribilis. Princess Anne divorced Mark Phillips with whom she has two children: Peter Phillips and Zara Tindall. Both children are married. Peter Phillips is married to Autumn Phillips and they have two children Savannah and Isla. Zara Tindall married Mike Phillips and with him has a daughter Mia Grace and Lena Elizabeth. The strenuous and unhappy marriage between Prince Charles and Princess Diana became ‘official’ public knowledge with the publication of the book, Diana: Her True Story, written by Andrew Morton. The book reveals among other things extramarital affairs of both Charles (his affair with his future wife Camilla Parker-Bowles who he marries in 2005) and Diana. Prince Charles and Princess Diana married in 1981 and divorced in 1996 – only a year before the tragic death of Diana in a car crash in Paris. Prince Charles and Lady Diana have two sons: Prince William from 1982 and Prince Henry from 1984. In 2011 Prince William married Catherine Middleton and together they have two children: Prince George from 2013, Princess Charlotte from 2015, and Prince Louis from 2018. As mentioned Queen Elizabeth II is the firstborn of King George VI and Queen Elizabeth. As you can see on the royal family tree of Britain on this page there are two crown illustrations occurring within the same generation: There is both a crown on King George VI and on his older brother King Edward VIII. This is because King George VI inherited the throne after King Edward VIII chose to abdicate from the throne in 1936 – the same year he was made king. King Edward was in love with an American woman, Wallis Simpson, who was not only divorced once but in the middle of a second divorce. Now all this divorcing was too much for royal British protocol, so King Edward chose to follow the path to love rather than status and chose to resign as King and thus pass on the throne to his brother instead. 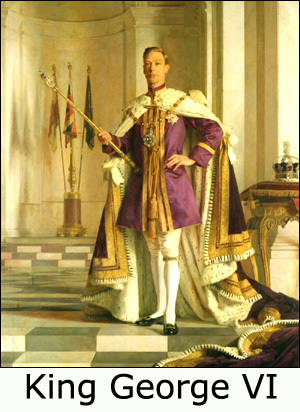 King George VI was king from 1936 to his death in 1952. Like his son King George VI, King George V wasn’t supposed to be king as he had an older brother closer in line to the throne. However, Prince Albert Victor died of influenza in 1892 and suddenly the future King George V was next in line to the throne. King George V not only inherited the position as future king from his brother, he also married his fiance Mary of Teck. 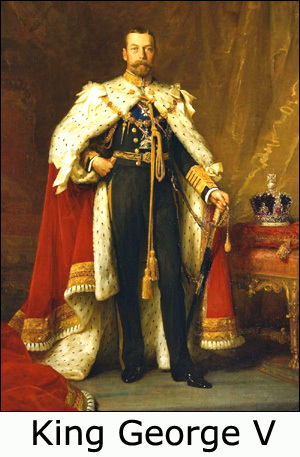 King George V was king from 1910 to his death in 1936. He had six children. King Edward VII was the second child of Queen Victoria and Prince Albert. The first child was Princess Victoria, however, being only heiress presumptive, she would have to give the position of heir to a brother if one such would be born. Thus even though future King Edward VII was second born, he was still the immediate heir to the throne. 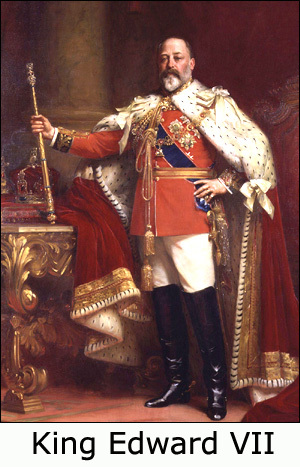 The reign King Edward VII was fairly short from 1901 to 1910 as his mother had a very long reign. The Queen of King Edward VII was Alexandra of Denmark and together they had six children. Queen Victoria was queen from 1837 when she was 18 years old to her death in 1901. 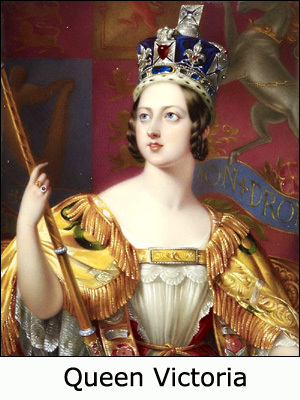 She inherited the throne not after her father Prince Edward but after his brother William IV – there were two more brothers besides besides Edward and William but they were already dead. And since there were no more males in that line of succession (all four brothers were dead leaving no legitimate children) the throne was now Victoria’s. Victoria married Prince Albert and together they had nine children.